Jon is excited to hit that $15.00 per hour wage increase at his next employee review. At a starting wage of $12.50, he knew with time and a great work ethic, his salary would rise so he could stay at a job he loved. However, word has come down that the company has to implement a $15.00 minimum wage across the board, as well as a hiring freeze to pay for it. He hopes the company can afford to grant him a fair increase, but the financials are not on his side. On the employer side, Kathy wrestles with a sticky triad of ethics, cost, and regulation. Like most small business employers, she hopes that her business will do well enough to pay her employees a fair wage and benefits to enrich their lives. However, doing so depends upon many factors, and these keep her up at night: job descriptions and salary levels, training requirements, the level of expertise necessary, and the cost of regulations. She asks herself, will my business be profitable enough to be worth the time, investment, and risk? Will a higher minimum wage requirement help my business thrive, or will the new law force me to raise prices and lay off employees? Labor groups and employers across America are engaged in vigorous debate about the issue of minimum wage. Complicating any coherent discussion on the issue is its inherent non-homogeneous nature. Wage impact studies must take into account local, state, and federal economies, different industries, the existing minimum wage laws, and the jobs demographic (type of job, age of employee, starter job or skilled worker, tips as a percent of income, etc.). This stew of variables, combined with a polarized political environment, makes empirical studies automatic targets for validity complaints from skeptics. Both conservative and democratic states have passed increases in minimum wage laws, but nearly everyone is concerned about the potential costs to low-wage workers in the form of lay-offs and lost opportunity for less-skilled workers. Time is necessary to decide definitively whether the effects of minimum wage hikes are a net positive or negative. After the second wage increase to $13 per hour, worker hours were reduced by 9.4% even as the compensation for low-wage jobs increased by around three percent. Consequently, total payroll fell for these jobs, decreasing average worker earnings by $125 per month in 2016. Low-wage jobs declined by 6.8%, a loss of more than 5,000 jobs. It should be noted that experts on the minimum wage are closely examining this study’s data, and it has not been peer-reviewed. 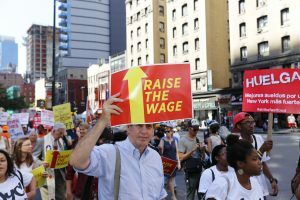 Though the study notes a drop in real wages due to reduction in work hours, its value may be as a bell ringer for cities such as New York, D.C., and the state of California, each of which recently passed $15 minimum wage laws. As of January 1, Massachusetts’ minimum wage is $11, with public pressure to join states such as California, New York, Washington, and Oregon. There is little consistency between $15 wage laws. For example, in Seattle companies with more than 500 employees must pay $15 per hour, $13.50 if health benefits are included. Unfortunately for franchise owners in Seattle, the number of national franchise employees determines the minimum wage to be paid. Therefore, a local Dairy Queen owner who already works 60 to 70 hours per week with seven employees, may have to decide whether to lay off workers and work more hours, or raise prices. Minimum compensation in some states also varies depending upon whether an employee receives tips or benefits, if they are farm workers, their age, and the population density. California, Washington, Oregon, and New York phased in minimum wage maximums, giving employers time to plan. An unavoidable fact is that less robust economies may suffer from the economic certainties of supply and demand: higher wages equal higher prices, reduced profits, fewer business starts, and ultimately higher unemployment rates – particularly for disadvantaged groups. For example, Oregon and Seattle struggle with high youth unemployment. In Oregon, where minimum wages have been among the highest in the country, the average age of a minimum wage worker is 35 (LERC, 2014). Rising minimum wages mean that an employer may replace two minimum wage workers with one more highly paid, better-skilled worker, as was shown in the Seattle study. In Oregon, the 2016 teen employment rate was 12.4%, 20% for those 16-19 years old), and in Seattle, it was 13%, 28% for African American youth (U.S. Bureau of Labor Statistics). The causal impacts of higher minimum wages on certain groups seems clear, especially since cutting or automating a process like ordering or check-out are options. 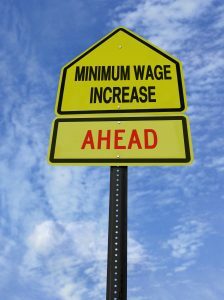 Finally, for healthy state and local economies, raising the minimum wage may in fact stimulate local economies and boost job growth as households increase disposable income. In 2014 , the Congressional Budget Office reported that a $10.10 minimum wage increase could lift $900,000 people out of poverty. Conceivably, reductions in poverty coincide with reductions in welfare and social programs. Giving low-income families a hand up and out, are social justice concerns that most businesses support. What Can Small Business Employers Do? 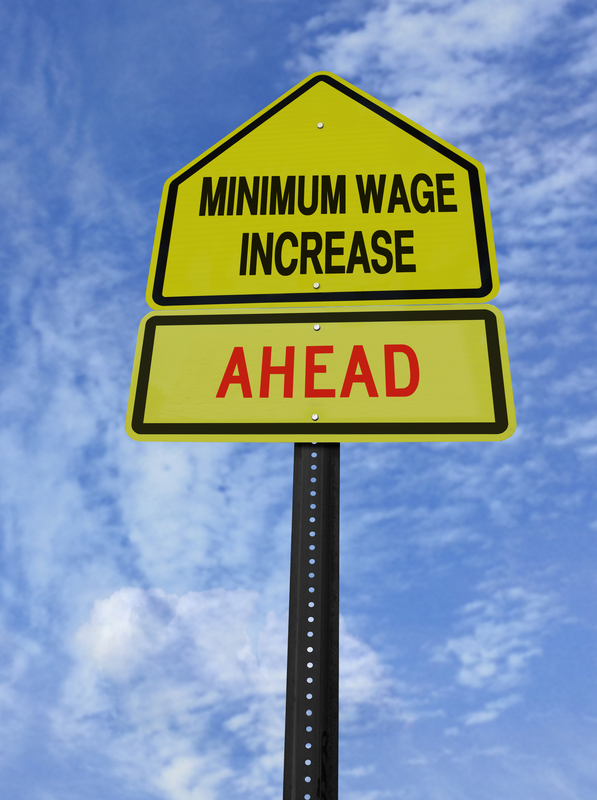 Most minimum wage laws originated with a ballot measure or legislative action. Pay attention to groups such as Fight for $15.org, who may have chapters advocating for ballot measures at the state and local level. Keep up with labor and wage trends in your local market. And stay involved with industry groups and local Chambers of Commerce who can help small business owners have a say on how new minimum wage laws might be written. Partnership Employment is here to help when you have questions or concerns about fair employee wage levels, standards of compensation, or labor regulations within your state. As a leading provider of full-time, part-time, and temporary staffing, can match your company’s requirements with the perfect candidate.